My oldest daughter, MJ, has type I diabetes. I don’t write about it frequently although it is very much ingrained in our daily lives, but nowadays life just rolls along without much incident as far as the disease goes. I can’t figure out how something that drives me nuts multiple times a day and has a good bit of control over some of the function of our days has become sort of ho-hum and mundane. Our journey–which sounds euphemistic, but nightmare might be a little extreme–began six years ago. MJ had been symptomatic (unbeknownst to us) for probably about a year. Hindsight is so enlightening. I’m not a worrier, and she would complain of things that were isolated and seemingly normal or had a reasonable explanation. She would come home from school with a headache, and I would assume she was tired or needed a snack. Other days she would just be moody. Occasionally she would complain about her vision, while sitting 20 feet away from the kitchen counter, chewing her dinner, and telling me she couldn’t read the microwave clock. (I tried it–it’s impossible.) Anyway, the big tell was when she started getting up to use the bathroom EVERY night. Sometimes twice. Sometimes THREE times. We refused water before bed and still she got up. I was still pretty clueless, but my husband’s spidey senses were tingling. His brother is a type I diabetic diagnosed thirty years ago at the age of four. Type I diabetes is not considered to be hereditary, so we did not immediately jump to that conclusion. And one might think that having someone in the family with it would have given us a leg-up on the recognition factor, but The Sugar is quite a bi-polar animal. Low blood sugar is a serious concern for a lot of type I diabetics and my husband remembers being told what to look for if his little brother got dizzy or looked unwell. He remembers him passing out occasionally. Back then insulin was less reliable and so much less was known about the disease. 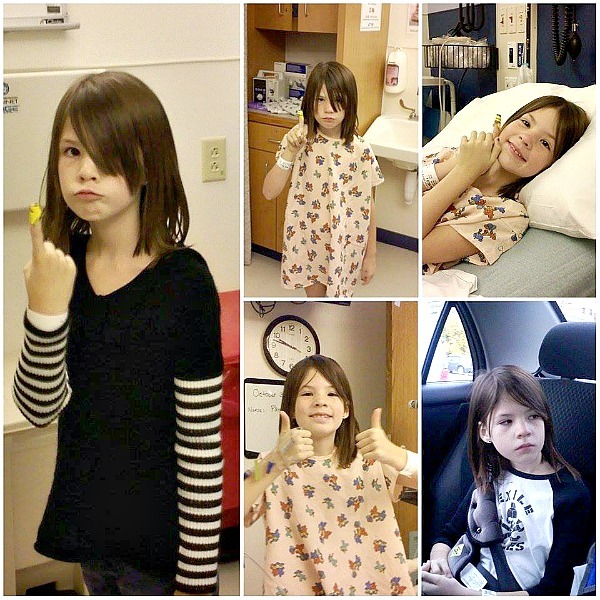 What we were unknowingly dealing with was the opposite end of the spectrum and not uncommon for undiagnosed type I–our daughter’s blood sugar was through the roof. My husband was insistent that something was wrong, but I felt that whatever it was could be dealt with at her annual well-check, scheduled a few weeks from then. I said, “If you really think there is something wrong, then you call and get her an appointment sooner.” He did. The appointment was two days away. I was annoyed because that was Trick or Treat night in our town and the appointment was for 2:00 PM, so I had to take her out of school early. We got to our family physician’s office and went over the symptoms. She asked a lot of questions, drew some blood, and took a urine sample. Then we waited and waited and waited. For about 45 minutes. I was not thrilled about the wait and was starting to get anxious. What could be taking so long? Never in a million years would I have guessed that the doctor would come back in the room and say, “I suspect your daughter has type I diabetes.” The Sugar. My immediate thought was that we were going to get a pamphlet, go home, and come back in a few days for a follow-up visit. I had no idea. I think it took some time for the shock to wear off. Neither of us started crying until we were in the car on the way to the emergency room. Driving to a big hospital and an even bigger Unkown. It was probably a blessing we found out that day. If we had taken her trick-or-treating and then let her have one or two pieces of candy–our usual MO–she could have gone into a diabetic ketoacidosis. This is a serious condition that occurs when the body breaks down fat–as opposed to glucose–for energy. This is what makes extreme low-carb diets work. Breaking down fat produces ketones which, in large amounts, are poisonous to the body. This is what makes those diets potentially dangerous. Her blood sugar had been so high for so long that there is no telling what would have pushed her over the edge from functional to something life-threatening. Normal blood sugar should range between 70 and 100. Hers was over 500. In addition to the extreme thirst and blurry vision that MJ experienced, high blood sugar (hyperglycemia), can cause mental confusion. They tested her blood glucose level several times at the emergency room because they couldn’t believe she wasn’t acting loopy or having any issues functioning relatively normally. She is pretty tall for her age but was thinner than she should have been at the time since she hadn’t put much weight on the previous year due to her body burning fat for energy. The doctors surmised that her body had learned to adjust to its prolonged hyperglycemic state. We stayed in the ER for a few hours before being admitted. One thing the hospital was pretty good about was making sure that you were comfortable with the day-to-day care before they sent you home. In other words: we were in for a few days, at least. I think spent less time learning how to care for her when she was a newborn–when I had less experience and more to do. Right away my husband and I agreed that we wanted MJ to try giving herself the insulin injection and that we would proceed based on her willingness or ability to do so. With some practice on a teddy bear designed specifically for that purpose, she mastered it. We were hugely proud of her. If someone had told me one of my children was going to be diagnosed with an incurable disease I would not have pegged her as one to take it so well, but she did. For all this disease can take away, it seemed to give her a certain confidence she never had before. It’s basically a big numbers game, but the numbers change constantly, so you can’t just skate by at any given meal. You have to do the math every time. It’s hard to get comfortable with things when you are measuring food, researching food and administering life-saving medication to your child. And that’s not a bad thing. But somewhere along the road things do get comfortable. You learn a lot, and then you learn some more, and a lot of things start to become commonplace in your life. Carb counts, test strips, ketones, syringes. It’s been six years this fall and things are not much different. We constantly assess how she is doing; we adjust things as necessary. We see the pediatric endocrinologist every three months. It is the ho-hum and the mundane. It is simply “Life As We Know It.” I occasionally wonder if we are too relaxed about it, but the alternative is living in fear, and I don’t think that is healthy. Could serious things happen with her diabetes? Absolutely. Do I want her in a constant state of worry about every detail of every activity and every bite of food? Absolutely not. Several years ago MJ wrote an autobiographical essay for school. She wrote about her family, places she had lived, things she liked to do, what she wanted to be when she grew up. She never mentioned her diabetes. I was a little surprised, since we deal with it constantly, but then I realized: as ubiquitous as it is in her life, it does not define her. She is not it, but she is stronger because of it. This is a guest post from Melanie Madamba from The Not So Super Mom. You can find her on Facebook, Twitter, and Instagram.